It’s been a rough week. It’s been rough personally, professionally, politically. Nothing is really bad – my kids are healthy, although Ruby had a scare at camp when she fell and banged up her cheek; my house is messy but still standing, even if all of the appliances seem to have signed some kind of bizarre electronic suicide pact; my dad’s health seems to be improving, even though he remains steadfast in his belief that the entire health care industry is a vast conspiracy – but it’s just been hectic and stressful, and Westboro Baptist Church has been in town being its own special brand of disgusting, and it’s so hot I get sweaty just walking from my house to my car at 8 a.m., and sometimes you just need to sit and chill and eat some figs. Luckily, we have a fig tree in our backyard that is loving its job, and we have a ridiculous amount of figgy goodness. With all apologies to Tim McNally for venturing into cocktail territory, this fig-infused cocktail has all of my favorite flavors (I use fresh fig puree and Maker’s Mark instead of Four Roses) (I’ve also subbed ginger ale for the cream soda; it’s equally delightful!). 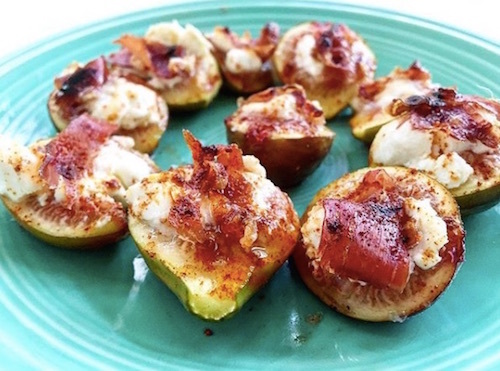 The kids won’t touch the figs – “they’re squishy” “the seeds are weird!” – but that’s OK.
More figs for the rest of us to eat while we watch the world burn! What’s your favorite way to use up this crazy-abundant summer fruit?